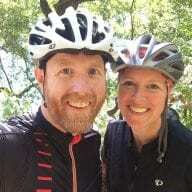 We have completed an extensive series of test laps to provide hard data quantifying the impact of watt, weight, and equipment changes in Zwift. A 75kg rider completes a full lap at 4 w/kg 3:40 faster than a lap at 3 w/kg. Therefore, each increase of .1 w/kg makes a difference of approximately a 22s in your full Richmond lap time in this weight and power range. If we look at the lap times for a 250w lap for riders of 100kg and 83.3kg weights, we can surmise that in this weight and power range, each kilogram of weight you lose will cut 5.8 seconds off your Richmond lap time. If w/kg stays constant, the heavier rider will always be faster, even up hills. At 3w/kg a 100kg rider finishes a full Richmond lap 3:45 seconds ahead of a 50kg rider. Increasing your wattage makes you faster–and the heavier you are, the more difference it makes. The same wattage increase (from 200 to 250 watts) tested with different weights resulted in very different Richmond lap time spreads. As wattage increases for riders of various weights their speeds get closer together. Anywhere over 400 watts riders of various weights travel at essentially the same speed, while at 150 watts a 50kg rider is 8:28 faster than a 100kg rider over a full Richmond lap. The taller you are, the slower you’ll go. The test laps we’ve done show that it works out to ~30 seconds longer on a full Richmond lap for each 15cm (approximately 6″) of height added. Or to put it another way: a 5′ rider will be ~1 minute faster than a 6′ rider (all other things being equal). Equipment does matter–especially wheels! The Zipp 808’s (the level 10 unlock) are 19 seconds faster over a full Richmond lap than the “stock” 32mm carbon wheels. 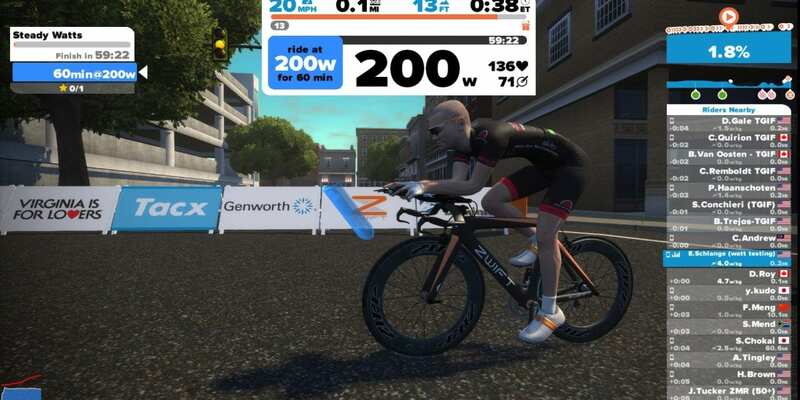 The fastest bike available to all riders (other than the TT bike) is the Tron bike, which is 68 seconds faster than the stock Zwift Carbon over a full Watopia Figure 8 lap. The difference between the stock setup (Zwift Carbon and 32mm carbon wheels) and the fastest race-legal setup (Tron bike) over one hour of riding is approximately 60 seconds. The Zipp 808’s are the best wheel on all current courses. In the real world you might choose to avoid such a deep wheel due to wind/handling issues, but on Zwift this isn’t a factor so aero wins the day. They may be a bit heavier in Zwift’s calculations than a wheel like the Zipp 404 or 202, but the aero advantage wins out when all your courses are loops. Upgrading your bike and wheels has a synergistic (not just an additive) effect. That is, the overall lap time saved by upgrading your bike and your wheels is more than what you would get if you added the savings of just upgrading the bike to the savings of just upgrading the wheels. Who knows why? It just works. Logically combining Cervelo S5 with the Zipp 808’s would save a total of 30 seconds. But instead, it saves a total of 33 seconds. Total lap time with Cervelo/808’s is 29:06. Riding up Libby Hill at 150 watts and 100kg is a slooooow process! PreviousRider categorization based on FTP — how do you rank? Nice test! In the section “Effect in terms of weight” you write that a heavy rider is faster than a lighter one. Shouldn’t it be other way around? Hi David–it would be the other way around if both riders were putting out the same watts. But if both riders are putting out the same w/kg, heavier will always be faster–even up hills! Can you help me understand the math or physics of this? Shouldn’t the additional weight work against the heavier rider, thus requiring more overall watts to move up a hill as a lighter rider at the same speed? And if that is so, then isn’t equilibrium reached once both synchronize their watts/kg of output? It IS a bit confusing to think about, isn’t it? But if putting out the same W/kg, the heavier rider will almost certainly have a bigger frontal area and so need more w/kg to overcome the increased resistance – ie the heavier rider will be less aero. Additionally when going uphill, won’t the heavier rider have to put out more w/kg to overcome gravity than the lighter rider? Heavier rider will have to put out more WATTS up a hill than a lighter rider–but not more w/kg. At the same w/kg, the heavier rider will be faster than the lighter. Think about it this way: Let’s assume a 50kg rider doing 4 W/kg and a 100kg rider doing 4W/kg. That’s 200W vs 400W. On flat ground the heavier rider has more drag than a lighter rider. The drag factor difference is not so much so at the same W/kg, the heavy rider goes faster since he’s putting out 200W more than the light rider and might only have 100W of that going towards the extra drag. On an incline the difference in work being done by the heavy and light rider becomes much more substantial than the drag. When people feel the lighter rider doing the same W/kg as a heavy rider should automatically be faster than the heavy rider they are forgetting that this will not happen at low inclines. It will absolutely happen if they were riding up a near vertical wall, but our run of the mill hills are closer to flat than vertical. Think about how hard it is for a 100+kg rider to put out the same W/kg as a fit 50kg rider and you’ll understand why you don’t see this in real life all that often. Hence the “law” that smaller riders own on the hills. If both riders ride at 3W/kg and rider 1 weighs 100 and rider 2 weighs 50, rider 1 will put out 300W (100 x 3w/kg), and rider 2 will put out 150W (50 x 3w/kg). Thus, rider 1, although heavier, is putting out double the amount of power and will be accelerating up the hill faster than rider 2. Where your confusion comes in for riders with different weights, especially on climbs, is the energy expenditure. Rider 1 will fatigue much faster than Rider 2 because Rider 1 is heavier and need to push that amount of power to go up the hill. Rider 2 being light, will save more energy for the rest of the ride. So a 100kg rider is FASTER than a 75kg rider on a course with hills if both generate 375Watts. Incidentally, it would be awesome to see some stats on acceleration by weight / power. No, the 100kg rider is slower. The further the bar is to the right, the longer your lap time is. So at 250w a 100kg rider takes 1845 seconds, a 75kg rider takes 1694. Apologies – just looked on my pc instead of phone and it’s all lined up correctly now. Thanks. I ride a Cervelo S5 IRL, I’m thinking the manufacturers should be giving us a bike code for Zwift! I’m at level 21 and drooling to get the S5 at level 25. Great write up!?? Have you tested the Buffalo bike? I’ve heard it’s as fast as any other bike on Zwift. It is indeed fast–the fastest bike other than the TT, actually! The folks at Zwift HQ are silly billies! 3rd bullet under wheel section should be 808’s I am guessing instead of 32mm with the Zwift Carbon? You are correct! Fixed it. Thanks! Re: methodology… when you see 200w for the lap, that means we stayed at 200w for the entire lap. It’s not an average, it’s a precise, steady wattage. The basic take away there is that a big guy will have a bigger CdA than a small guy, but the difference is not as much as the difference in weights (CdA scales with m^2, weight with m^3). The aero-nerd in me would like to see Zwift allow users to input their CdA, not just their weight. There can be huge differences depending on how good someones position is on the bike (my CdA on a road bike for example is almost certainly lower than what they are modeling as average). The realist in me doesn’t think that should happen because almost no one knows their CdA well and it would just end up as one more thing for people to cheat about. Simple, just incorporate a webcam aimed at the rider from the front. This’ll give frontal area which can give a good rough estimation. A heavier rider with the same w/kg than a light rider will be faster up a hill makes no sense. W/kg is the power common denominator for cyclists. If both riders are generating 300W of force up a grade, the lighter rider will be faster, simply less mass. If a 100kg rider is generating 500w of force to attain a certain speed up a grade, that rider’s w/kg is 5. For a 75kg rider to keep the same speed, they need to produce 5 w/kg, or 375W. Ergo, the lighter rider generating 5w/kg will be considerably faster. Put the two riders on a hill and time them and all variables, CdA, Crr, air mass, mechanical efficiency, etc, will be factored in. CdA is of little consequence at 5 km/h on a 12% grade. Weight is. The light rider will be faster if they’re doing the same WATTS as a heavier rider. But if they’re doing the same w/kg as a heavier rider, the heavier rider will always be faster–on hills or flats. A few of you guys are missing the w/kg (watts per kilogram) part. It is not each rider putting out 300 watts, it is each rider putting out 3 watts or whatever per kilogram (3 w/kg). Multiply their body weight in kg times 3 to see the resulting watts. The heavier rider will drop the lighter rider on downhills. Momentum on small rollers will let the heavier rider put a hurting on the lightweight rider. Kind of long, but here is the response to those asking about why on equal watt/kg a heavier rider is faster. Realize that it’s the same situation as a flat TT. We all know that a big rider like a Fabian Cancellara absolutely crushes a smaller guy like a Nairo Quintana in a TT, despite Nairo having a much higher w/kg (seen because he drops Cancellara on long mtn climbs). Why? Simple answer is that weight is a minimal penalty on flat ground. It basically only adds to rolling resistance, which is very minimal. With no wind resistance in a vaccuum one would travel something like 56mph (around 100 km/hr) with 100w. Now, most bigger guys are also penalized a little bit because they tend to take up more space, and thus have higher CdA/drag from air. HOWEVER, this difference is usually reasonable small between a bigger and a larger rider, enough that 360w with a very small CdA like a Quintana is substantially slower than 450w from a bigger rider like Cancellara who takes up only marginally less space than Quintana through the air as a result of good position. Remember is NEVER DISSAPEARS completely. Even on steep climb, a portion of your power is going to push air out the way, not to overcome gravity. How much goes to which aspect depends on the speed and steepness of the gradient, but is always there. -Our 50kg rider will need 335w to climb a 6% grade at 15mph. Of those watts 263 are needed to overcome the force of gravity/rolling resistance, and 72 are needed to overcome aerodynamic drag. This is basically what you would expect. Our 50kg guy needs 5.26 w/kg to overcome gravity/RR, and our 70kg rider needs 5.07 w/kg to overcome gravity/RR. This difference makes sense because bike weight is less relative to the larger rider, and because rolling resistance doesn’t scale linearly with weight. So already, at equal w/kg we see an advantage for the guy that is heavier as a result of bike weight and RR. This is exacerbated by the difference in w needed to overcome air resistance. 70kg rider needs 75w to overcome air resistance, and slightly smaller 50kg rider needs 72w to overcome air resistance. So, while riders A & B need similar w/kg to overcome gravity, they need identical watts to overcome the wind resistance aspect, resulting in a higher w/kg necessary for our lighter rider to keep up with our heavier one. This looks like a stupid gap to make up, and seems hugely favorable for a big guy, BUT w/kg highly favors smaller body sizes. 5 w/kg is not that difficult or impressive for a 5’4″ guy weighing 54kg, but a 5w/kg FTP for an 85kg rider is MONSTROUS. If this wasn’t the case then cycling would be like basketball, only big lads could play. For uphill, don’t forget that when riders are equal in watts/kg body weight, they are not equal in watts/kg total weight. A 100 kg rider at 3 w/kg pushes 300 watts. Including bike and stuff (bidons, food, etc.) at 10 kg that would be 300 Watts at 110 kg (or 2.73 w/kg total). A 50 kg rider would push 150 watts at 3 w/kg body weight. Including bike that would be 150 w/60 kg total weight, or 2.5 w/kg total weight. That’s a good point, Bertram. And we don’t know the exact weight of the “bike and stuff” in Zwift, but I’m sure that at least partially explains why a heavier rider will go faster than a lighter rider at the same w/kg (body weight). can you tell me what the fasted bike and wheels for going u hill would be? would the tt bike with 808 still be the tastes? Got to get to 400 watts FTP – is this possible for a 50 year old. Well, I don’t know, but this is my challenge. Seeing a 3.2 w/kg rider and then looking at their watts hovering around 190 watts is just annoying when you are pushing 300 watts to keep up – but the down hills are nice! have a height weight scenario for you. with this info, a 75kg rider putting out 4w/kg will be slower than an 80kg riding putting out 4w/kg . how would height factor into this equation since you state a taller rider will be slower. if the 75kg rider is 15cm smaller than the 80kg rider, who has the edge…the heavier rider or the shorter rider? Well, let’s see… I didn’t do any tests at 80kg, but I did do 83.3. I’ve got numbers at 3 w/kg for both. 75kg does a Richmond lap in 29:39, 83.3 does it in 29:08… so 31 seconds faster. Moving this up to 4 w/kg should bring those times a bit closer together, but I’m not exactly sure how much. 15cm of height difference is about 30 seconds in speed difference. So in your scenario, the riders should be turning laps at nearly the same speed. I would give a few seconds of an edge to the shorter rider though. How do you measure, W/kg, just rider weight or rider weight + bike weight? Would think the extra 7-8kg for the bike weight would be less of an impact for a 100kg rider as it does for a 75kg rider if they’re both putting out the same W/kg based on just rider weight. 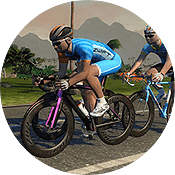 w/kg in Zwift is just rider weight… bike weight is not included in the w/kg numbers you see, although it IS included in the overall game physics. You give times to the second, but no indication of an error margin. How do you control the power? Is it through a controllable motor (e.g. an electric bike) or just a person riding as consistently as they can? Are these single lap times or an average of several laps? Probably in “Workout Mode” with wattage preset and riding in erg mode. This way, the wattage remains the same no matter what, but your speed will +/- depending on the grade. It’s kind of top secret, but let’s just say I didn’t have to do the pedaling myself, and the power numbers are perfectly consistent. ? I’m guessing you’ve just created an app that sends out an Ant+ signal mimicking a power meter. No way for Zwift to know the difference, it’s just an Ant+ stream. I like to ride the classic steel bike with classic rims. I assume this is the slowest combo. What is my handicap? It’s all right here: http://zwiftinsider.com/test-lap-data/ although I didn’t do a lot of tests with the Zwift Steel and classic rims combo. Classic rims add about 5 seconds to the speed of the standard 32mm carbon rims. Steel bike adds about 6 seconds to the speed of the standard Zwift carbon frame. So you’re at least 11 seconds slower than the “standard” setup on a lap of Richmond. I don’t get the convergence at 400 + watts ?!? After reviewing the data (from the link on this page), I cannot see how (in real life) a 50kg rider doing 500 w would be doing the same speed up Libby Hill as a 100kg rider also doing 500w… basically, Sagan would not have won the WC’s if it was done on Zwift. Well, keep in mind this is for a full lap (so flat, then as much downhill as there was uphill). If you look at the stats (http://zwiftinsider.com/test-lap-data/) you’ll see the lighter rider is always faster on a climb than a heavier rider at the same power. That said, over a full lap we have to remember that weight makes little difference on flats… and on the hills, while a lighter rider will climb faster, the heavier rider will descend faster. I dont know if the convergence at high wattages 400+ remains unchanged. have you retested the results from the test sheet recently? Your normal rides probably aren’t at the same intensity right? Increase your tire pressure and/or increase tension on the trainer until slipping stops? It may only need subtle changes, you shouldn’t need to crank it down. You may also get better results with a dedicated trainer tire if you are not already using one. I have the same issue as the OP. I tried doing the FTP and whenever it asked me to hit 200W or higher, I would get the “Tire Slippage” error and told to wind down my Watts. I use a Vittoria Zaffiro Pro trainer tire (red coloured) filled to 130 PSI (max is 142 I think?) on a CycleOps Fluid 2. This is paired with a Garmin 500 + Speed/Cadence sensor and USB cabled Ant+ dongle rubber-banded to the chain-stay next to the cadence sensor. Shouldn’t be getting slippage or dropped speed/watts but here we are. 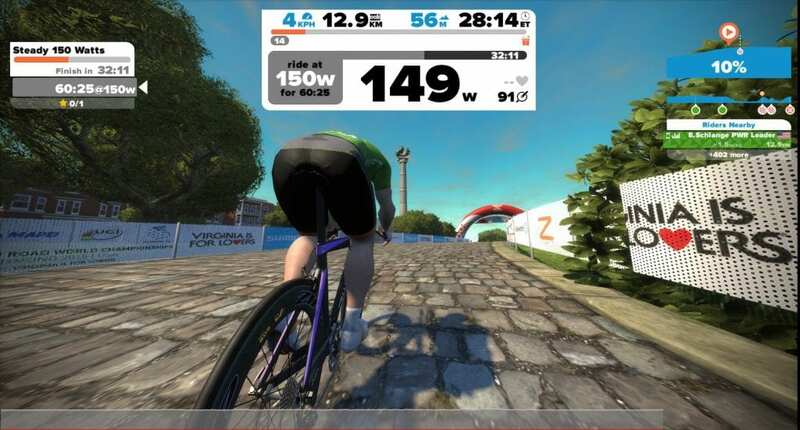 Think it’s clear that Zwift is meant or is designed ideally for power meters of once kind or another – wether it’s a Smart trainer or pedals or other, imho. Thanks for all the great data. I have a suggestion for another data point to test. I would like to see some data on acceleration. Perhaps standing start to 500 watts for 30 seconds and then measure the distance covered.